I was born in Atlanta. Like the fictional character Prissy from “Gone With The Wind”, our small community hospital had limited abilities when it came to delivering babies so many of our mothers ended up in one of the Atlanta hospitals for the big event. Mine was no exception. Atlanta has, ever since then, been at least a part of my life, if mostly just to serve as a place to go for things you can’t get locally, or an escape to be a part of the urbanity of a big city for a few hours before returning to the small town world. My mother enjoyed going to Atlanta to shop and spend the day; my father much less so, although he did enjoy an occasional Braves game. In more recent years I have found more reasons to avoid going to Atlanta than to go, mainly due to endless traffic. There is an old saying that you can’t go to hell without going through Atlanta and for us, you can’t go to Atlanta without going through Henry County, the central nexus of metro Atlanta traffic woes. As big as Atlanta is, for me it usually boiled down to the airport, the World Congress Center for car shows, the Varsity and Lenox Square Mall. I suppose I was ignoring the other 90% of the city, and I shouldn’t have been. Lately though, my family and I have gone up there more often, because we’ve actually found a pretty cool place to go and spend part of the day, in a part of Atlanta that I never really thought much about before, nor spent much more than the time it took to drive through it on the way to somewhere. East of the urban phalanx of skyscrapers that makes up what many think of as being “Atlanta” sits Ponce City Market, surrounded by vibrant, revitalized structures, lush historic old neighborhoods and well-known community parks. Located next to the Atlanta Beltline, a former railway corridor that surrounds the core of the city and which is being developed now as a multi-use trail, Ponce City Market, or PCM as many of the locals refer to it, is like the giant, beating heart of the area, pulsing with energy and life in an area that was, until recent years, in a state of decline. So what is PCM? First of all, it’s a destination, inside the old Atlanta Sears building on Ponce de Leon Avenue, one of Atlanta’s main streets. With an interior space of 2.1 million square feet covering about 16 acres, its one of the biggest buildings by volume in the southeast. Built in 1926, it was the Atlanta regional headquarters for Sears, combining administrative office spaces, warehouse spaces and retail shopping for over 60 years. Later it served as an adjunct of Atlanta City Hall for 20 years, closing in 2010 and sitting vacant for a few years. So what do you do with a giant old Sears building when there just isn’t much of a market for that kind of building? Renovate and restore it. Turn it into a mixed use development project. Attract retailers, restauranteurs, artists, offices and residents all under one very large roof. Offer a variety of things to see and do, watch it flourish and take the neighborhood right along with it. Put simply, it’s the best example of adaptive reuse of an existing building that I have ever seen in Georgia. Filled with boutique shops, anchor stores from successful chains, a variety of restaurants and a rooftop amusement park, PCM is definitely worth a trip to Atlanta to visit and experience. My family and I went up for the first time on a Saturday morning, arriving in time for lunch. If you have a smart phone and can get the WAZE traffic app, it will help you navigate there, and reroute you around traffic problems if you put your trust in it and follow its commands. We came in off of North Avenue on the backside of the building, which is where the parking lot is. Don’t worry if you can’t find a parking space in the outdoor lot, because a huge underground parking deck affords easy access to the building and will keep your car cool from the summer sun. This is Atlanta, however, so don’t be surprised that you have to pay to park at PCM. It’s not much though, and this can be done in one of two ways: at kiosks located throughout the parking area or through the ParkMobile app, which you can download and set up on your smartphone. One piece of advice though-set this up for first time use ahead of time so you are ready to use it as soon as you find a parking place. As I mentioned, parking costs are very reasonable and part of the proceeds go towards programming and improvements on the adjacent Beltline project. Once you’ve parked, take the steps or the elevator up to the ground level and head inside for the PCM experience. My first impressions were very good, once the inner architect that lives inside of me calmed down. I love old buildings, especially early 20th century urban structures and PCM pressed all my cool building buttons from the moment I saw it. The sheer size of the building, the old brick walls, windows and fire escapes, the exposed steel beams and trusses everywhere, all demanded my attention, drawing it away from the variety of shops in the plaza area just outside the main building. The plaza houses stores selling clothing, jewelry and specialty items, as well as a pretty cool bookstore, Posman Books, with a lot of local authors and regional writings represented. Once inside, the interior reverberates with an urban retro cool factor. Beautiful old and well-used hardwood floors throughout the concourse look to be original to the building, with stores and restaurants on every side. 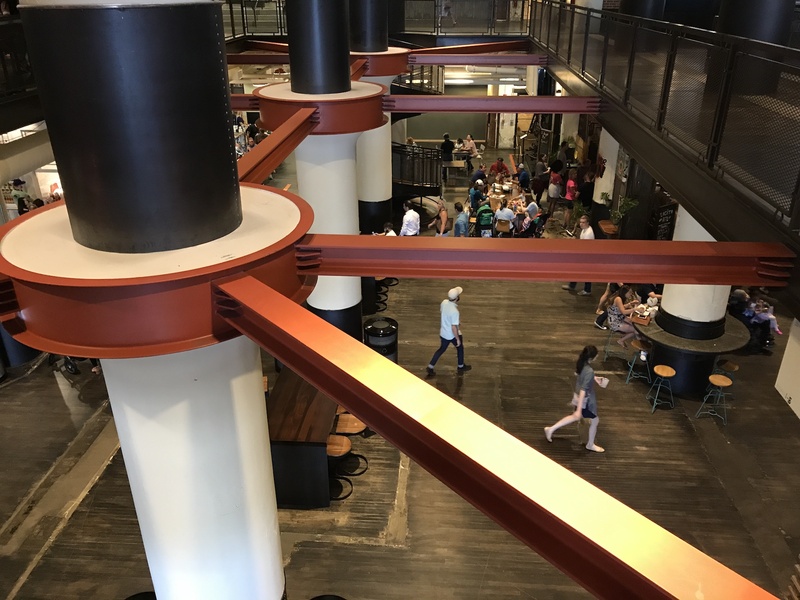 Some you order from and pickup your food, with ample tables along the food hall, (there is a difference between a food hall and a food court) while others have sit-down dining for those who want to relax and enjoy the views through the large windows. Our first trip there we had some really outstanding pizza at Brezza Cucina for lunch, with its airy, well-lit dining room; on later trips, we tried Hop’s Chicken, including their reputable chicken biscuits. Other stores we enjoyed included Collier Candy Company, where we found all kinds of candies, some that I had not seen since childhood. Citizen Supply features clothes and accessories made locally in Atlanta, and the Biltong Bar sells organic, homemade beef jerky that can be seasoned many ways. Nationally known stores such as Williams Sonoma, J. Crew and others help round out the mix. Keep in mind this is just a sample of the stores that take up the first few floors of the building, plus various annexes that are part of the property. The other floors contain office suites, residential lofts and apartments, as well as an amusement park on the roof. That’s the next thing we’ll be checking out. 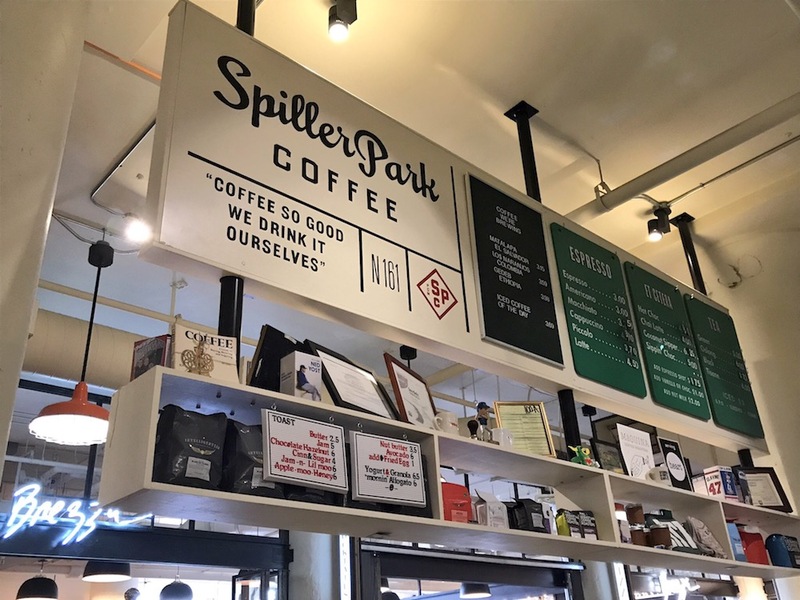 One place I enjoyed hanging out at was Spiller Park Coffee, in the main food hall right in the middle of everything. They specialize in some great coffees, including blends from Ethiopia, Kenya and Peru. You can order it and go sit down at the coffee bar and they will bring it out for you to enjoy and it’s a nice place for some delicious coffee, staffed by very friendly people. Spiller Park gets its name from the famous baseball field that once occupied the land across the street from PCM. It was the primary home field for the minor league baseball team called the Atlanta Crackers for nearly sixty years. When I talk about adaptive reuse, I don’t just mean the building but some of the artifacts that are on display throughout. The designers of PCM found ways to incorporate some fascinating stuff from the days of Sears into unique displays scattered around the public spaces. A display of old time clocks, housed within a motor mount used for an Otis elevator originally installed in 1947 is in the main lobby. 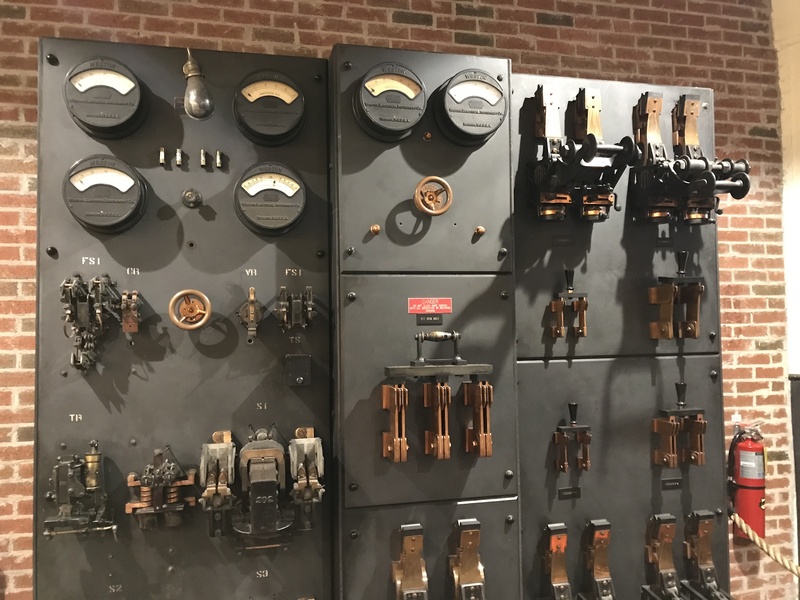 Near the food court, a display of electrical panels installed when the building was built has been turned into a museum-worthy piece that would look right at home in a power plant or Dr. Frankenstein’s laboratory. It’s really great to see these and other pieces used as displays that allows you a window to look back in time at what was then considered to be high-tech stuff. It’s also another way to connect with the building and its history. 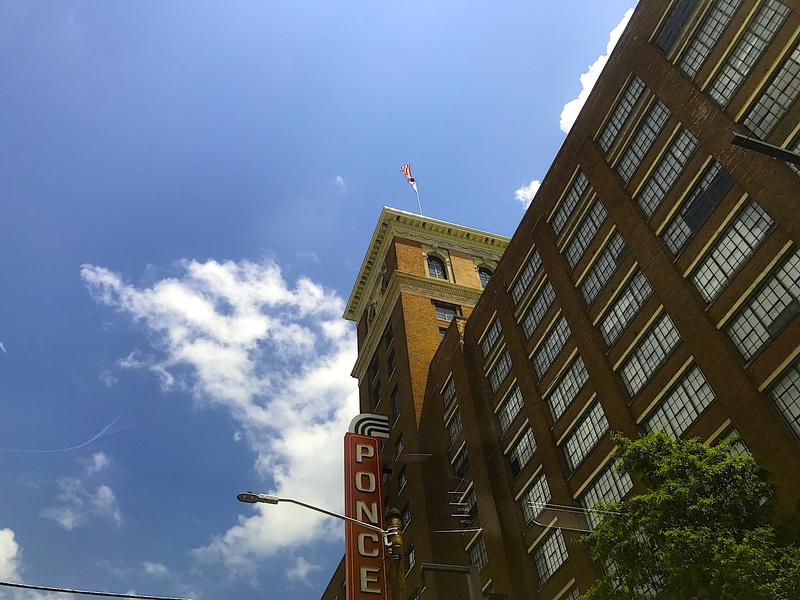 Most of all though, I was pleased to see how alive Ponce City Market was each time we went. Young families pushed their kids along in strollers through the vast assortment of places along the way. Older people, some of whom probably shopped there years ago, stopped to look at the familiar, yet new spaces of the vast store building. Cooking demonstrations were going on and a line waited at the massive freight elevator to take people up to the rooftop amusement park. You could feel a visceral sense of energy throughout the place. 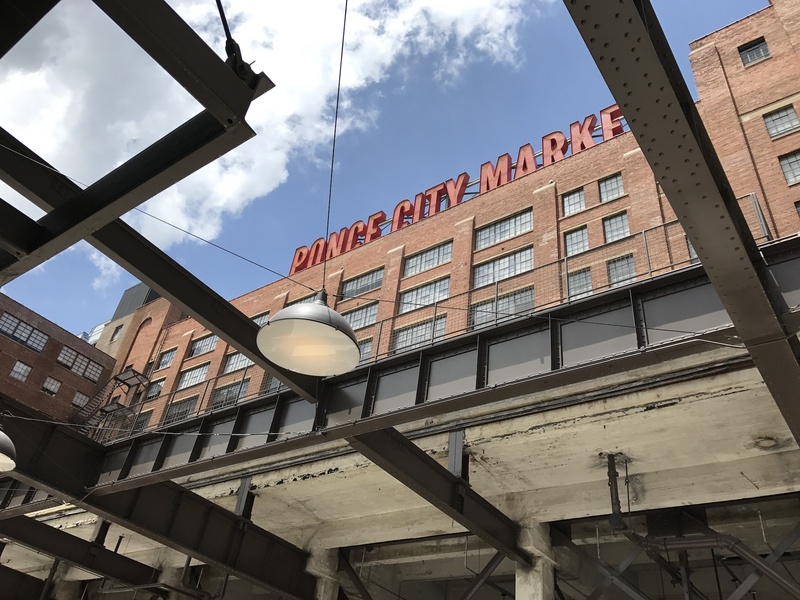 If you have a free weekend day, or pretty much any day of the week, a trip to Ponce City Market is well worth the time. Each time we’ve been, we came home with bags of neat stuff, while enjoying the location and seeing a lot of interesting things. We also enjoyed riding around afterwards and looking at some of the beautiful neighborhoods that are close by, such as the Old Fourth Ward, Poncey Highland, Virginia Highland and Druid Hills. 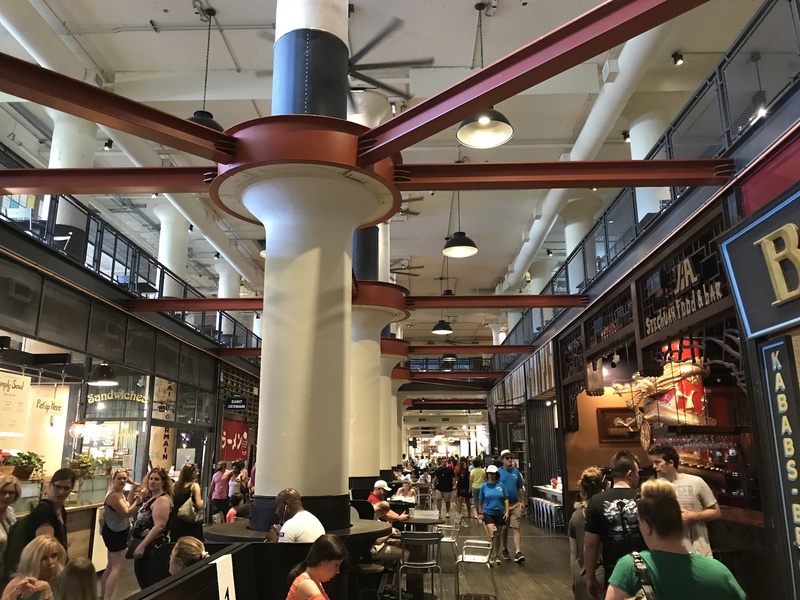 While it isn’t a vacation, its a great way to spend a day, and as nice as some of the other shopping venues are in Atlanta, none of them have the “cool factor” this place has. I’m already looking forward to seeing it at Christmas. Have a great summer and as usual, I’ll come up with some other places to write about!